When the United States declared war on Britain in 1812, it was widely believed that Canada would easily fall to America’s much larger population since Britain was already engaged in a life and death struggle with Napoleon. However, the invasion did not go according to plan. Aside from several naval victories, the first few American armies that entered Canada were either captured or forced to retreat back across the border. Control of border forts shifted back and forth until Napoleon’s abdication on March 31, 1814 freed thousands of British troops for a seaborne invasion of the east coast, which resulted in the burning of Washington. Since recently annexed Louisiana was considered ripe for the plucking, a fleet was dispatched to capture New Orleans, and thus improve the British hand in the on-going peace negotiations. Having just crushed a rebellion by the Red Sticks faction of the Creek Indians in Alabama, Andrew Jackson was sent to oversee the defence of New Orleans. 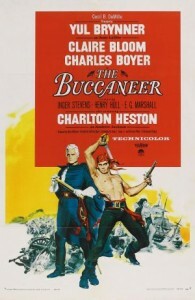 After learning that Washington had been burned by the British, Jackson (Charlton Heston) is sent to defend New Orleans. Aware that the bayous are the key to the city’s defence, when he hears that Jean Laffite controls the best approach to the city, he thunders that he will hang the pirate, not deal with him. 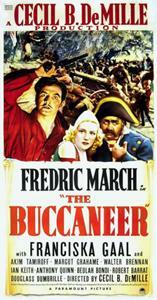 Laffite (Yul Brynner) leads a group of pirates who sell their captured cargoes at Barataria. A noble pirate who is in love with Louisiana Governor William Claiborne’s daughter, Laffite forbids the capture of American ships. The daughter of a rival captain also wants Laffite, which sets the stage for a love triangle. Two British warships suddenly appear at the pirates’ base with an offer of land, pardons, the rank of captain in the Royal Navy and 30,000 dollars in exchange for his support and knowledge of the bayous. Claiming to be attracted by American ideals, Laffite offers Claiborne men, ships and guns, although it seems likely that he is more attracted by the governor’s daughter. Claiborne agrees to recommend that Laffite be pardoned in exchange for his help but the defensive council refuses to accept the offer, so Barataria is destroyed during his absence. As Laffite tries to persuade Jackson to free his men in exchange for gunpowder and musket flints, news arrives that the British have reached a plantation near the city, so Jackson offers a pardon for any pirate who will fight. Everything is done at the last minute to create tension. The main defensive line at Rodriguez Canal is built quickly, the militia is only recruited when the British threaten the city and Laffite arrives with hundreds of pirates and gunpowder just in time to face the British. Actually, the main defensive line had been constructed over the course of a week, the real Jackson had used martial law to raise several militia units, and he had already received almost 4,000 reinforcements. Steady pressure by the leading citizens combined with a personal appeal from the Laffites convinced Jackson to allow the pirates to serve in his army. The destruction of Barataria is fairly accurate, except that the governor was against cooperation with Laffite. Aside from the fact that Jean’s elder brother Pierre is missing from the story, the Laffites were successful, if not law-abiding, merchants, but they were far from rich. The real Laffite rejected the British offer because much of his income came from smuggling slaves, which had been outlawed by the British. Not wishing to tarnish Laffite’s image, his slave trading is absent from the film. Furthermore, while many of the privateers did indeed sail under letters of marque from Cartagena, signed by Simon Bolivar, the brothers primarily bought and sold goods. Although they owned several small privateers, they did not go to sea until the end of their careers. Clearly based on the 1815 painting “Battle of New Orleans” by Herbert Morton Stoops, the final battle is anti-climatic, although it is cool to watch Congreve rockets in action. 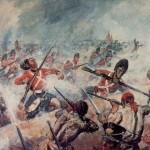 Since it is a love story, the destruction of a British army during America’s greatest victory in the War of 1812 receives 84 seconds of screen time. Needless to say, the British strategy and perspective are not shown. The myth that a motley force of Americans beat a much larger army of British professionals is a key part of the American identity. Actually, the numbers were roughly even, and the majority of British casualties were caused by cannon, not Tennessee sharpshooters. Unlike the movie’s flimsy defensive wall, chest high and only a few feet thick, the actual Americans were standing behind high, solid fortifications, while confusion meant that the British attacked without ladders. Furthermore, Jackson is shown using delaying tactics to slow down the British advance even though this was completely against the man’s character. Jackson had such an aggressive nature that when he was president, he even attacked the man who tried to assassinate him. When presented with an enemy, Jackson’s response was to lead all of his troops in an immediate attack that took the exhausted British by surprise but this battle and an artillery duel that took place several days later are absent. Many facts are stretched or simply ignored. The justification for the rich citizens of New Orleans buying smuggled goods is that no one wants to pay taxes on a war that is being lost. In reality, the French and Spanish who made up the majority of the city’s population had little interest in following the American government’s laws. Worse, the French and Spanish residents are given only token roles. The real Laffite did receive a pardon for all actions prior to January 8, 1815 but he refused to turn over a new leaf. In this version, he is doomed by events beyond his control. Most important, the film inexcusably ignores the bayous that were a key factor in the campaign. Jackson had no idea from which direction the attack would come, so he had to spread his forces over a wide area to cover all possible approaches. The route used by the British advance force was so exhausting that it could not take advantage of the element of surprise, while the artillery and the rest of the army had to be ferried in stages over several days. This time enabled Jackson to call in his reinforcements and build a powerful line of defense. Unfortunately, none of this appears in the movie. Despite Heston’s frequent thundering, he lacks enough fire to do Jackson justice, although it is a worthy attempt. Brynner’s Laffite is a little too noble and debonair to be believable as a pirate, but Boyer is superb as the world-weary adventurer Dominique You. It is not a horrible film, it is just a bit workmanlike with a weak story. Although DeMille supervised the movie, he should not be blamed since he was near the end of his life (he died the following year). Anthony Quinn was DeMille’s son-in-law at the time and he never directed another film. Great as usual to have this great website to turn to find out how a film stacks up historically. I enjoyed it perhaps because I was expecting another Hollywood mish-mash marred by numerous accuracies and the inevitably present love story but while all that was there, as this reviewer summarizes, there were some redeeming things about I. The goregeous Technicolor photography almost makes it worth watching for that reason alone but I was also impressed by the efforts made to show something about all the types of cultures and their colorful leaders that go caught up in the whole thing. Like the reviewer here says – `not a bad movie’, perhaps worth a look for all its historically contingent oddities. Thanks for the compliment, it definitely was a beautiful film. I wish that the love story had not been the main focus, but still it is an enjoyable film. I just wish that there was a proper film on the War of 1812.